Several years go, I sold the delicious Hautes Noëlles Muscadet when I worked for Daniel Johnnes and Jeroboam Wines in New York. They were an easy sell, vibrant and authentic productions of the Loire Valley's far west region near the mouth of the Atlantic ocean. The Domaine makes several whites and a couple of sparkling wines that I don't think are imported into the US, but that Muscadet is, and it's amazing. The Hého rouge, which we have here, is a simple red with good structure and easy profile. It's been a huge seller for The Carriage back in Florence, Ala. I bought this bottle in early December when I was up there for a few wine events. Under 1,000 cases of the rouge are produced each vintage, making it even more special, considering the value; it over delivers for the $15 price tag. The grapes are harvested by hand, then fermented separately, with the grolleau and gamay undergoing carbonic maceration, and the cabernet franc traditional fermentation and 100% destemming, which lends a softer mouthfeel than it might otherwise. The white wines are certified organic and the reds grown sustainably, leaning toward organic. 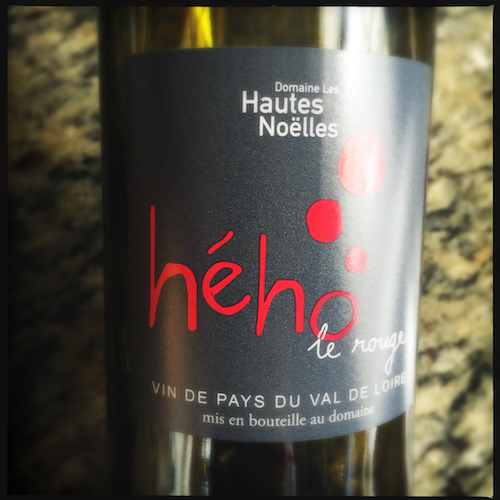 The Domaine Hautes Noëlles Hého Rouge 2014 is a blend of 45% cabernet franc, 45% grolleau noir, and 10% gamay. Juicy red berry aromas are followed by a friendly mouthfeel with fresh red currants and good structure-acidity balance, and a long smooth finish. You can drink this one on it's own or pair it with a variety of dishes. The name Hého translates to something like "Hey, wow!" as in "Hey, wow! This wine is freaking delicious and inexpensive!"